For other uses, see Château (disambiguation). 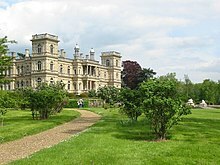 Château de Ferrières, the largest Château of the 19th century, was built in 1854 to house James Mayer de Rothschild, east of Paris. It is set in a 30 km2 (12 sq mi) estate. A château (plural châteaux or châteaus; French pronunciation: ​[ʃɑto] in both cases) is a manor house or residence of the lord of the manor or a country house of nobility or gentry, with or without fortifications, originally—and still most frequently—in French-speaking regions. The word "chateau" is a French word that has entered the English language (English plural: châteaus; French plural: châteaux), where its meaning is more specific than it is in French. The French word "chateau" denotes buildings as diverse as a medieval fortress, a Renaissance palace and a 19th-century country house. Care should therefore be taken when translating the French word château into English, noting the nature of the building in question. Most French châteaux are "palaces" or "country houses" and not "castles", and for these the English word "chateau" is appropriate. Sometimes the word "palace" is more appropriate. To give an outstanding example, the Château de Versailles is so called because it was located in the countryside when it was built, but it does not bear any resemblance to a castle, so it is usually known in English as the Palace of Versailles. In French where clarification is needed, the term château fort is used to describe a castle, such as Château fort de Roquetaillade. The urban counterpart of château is palais, which in French is applied only to grand houses in a city. This usage is again different from that of the term "palace" in English, where there is no requirement that a palace must be in a city, but the word is rarely used for buildings other than the grandest royal residences. The expression hôtel particulier is used for an urban "private house" of a grand sort. A château is a "power house", as Sir John Summerson dubbed the British and Irish "stately homes" that are the British Isles' architectural counterparts to French châteaux. It is the personal (and usually hereditary) badge of a family that, with some official rank, locally represents the royal authority; thus, the word château often refers to the dwelling of a member of either the French royalty or the nobility, but some fine châteaux, such as Vaux-le-Vicomte, were built by the essentially high-bourgeois — people but recently ennobled: tax-farmers and ministers of Louis XIII and his royal successors. However, the quality of the residences could vary considerably, from royal châteaux owned by royalty and the wealthy elite near larger towns to run-down châteaux vacated by poor nobility and officials in the countryside isolated and vulnerable. A château was historically supported by its terres (lands), composing a demesne that rendered the society of the château largely self-sufficient, in the manner of the historic Roman and Early Medieval villa system, (cf. manorialism, hacienda). The open villas of Rome in the times of Pliny the Elder, Maecenas, and Emperor Tiberius began to be walled-in, and then fortified in the 3rd century AD, thus evolving to castellar "châteaux". In modern usage, a château retains some enclosures that are distant descendants of these fortifying outworks: a fenced, gated, closeable forecourt, perhaps a gatehouse or a keeper's lodge, and supporting outbuildings (stables, kitchens, breweries, bakeries, manservant quarters in the garçonnière). Besides the cour d'honneur (court of honour) entrance, the château might have an inner cour ("court"), and inside, in the private residence, the château faces a simply and discreetly enclosed park. In the city of Paris, the Louvre (fortified) and the Luxembourg (originally suburban) represented the original château but lost their château etymology, becoming "palaces" when the City enclosed them. In the U.S., the word château took root selectively, in the Gilded Age resort town of Newport, Rhode Island, the châteaux were called "cottages", but, north of Wilmington, Delaware, in the rich, rural "Château Country" centred upon the powerful Du Pont family, château is used with its original definition. In Canada, especially in English, château usually denotes a hotel, not a house, and applies only to the largest, most elaborate railway hotels built in the Canadian Railroad golden age, such as the Château Lake Louise, in Lake Louise, Alberta, the Château Laurier, in Ottawa, the Château Montebello, in Montebello, Quebec, and the most famous Château Frontenac, in Quebec City. Moreover, in other French-speaking European regions, such as Wallonia (Belgium), the word Château is used with the same definition. In Belgium, a strong French architectural influence is evident in the seventeenth-century Château des Comtes de Marchin and the eighteenth-century Château de Seneffe. There are many estates with true châteaux on them in Bordeaux, but it is customary for any wine-producing estate, no matter how humble, to prefix its name with "Château". If there were any trace of doubt that the Roman villas of Aquitaine evolved into fortified self-contained châteaux, the wine-producing châteaux would dispel it. On the other hand, there are many striking châteaux in the Bordeaux region still depicting this Roman villa style of architecture, an example of this being Château Lagorce in Haux. The Loire Valley (Vallée de la Loire) is home to more than 300 châteaux. They were built between the 10th and 20th centuries, firstly by the French kings followed soon thereafter by the nobility; hence, the Valley is termed "The Valley of the Kings". Alternatively, due to its moderate climate, wine growing soils and rich agricultural land, the Loire Valley is referred to as "The Garden of France". The châteaux range from the very large (often now in public hands) to more 'human-scale' châteaux such as the Château de Beaulieu in Saumur or the medieval Château du Rivau close to Chinon which were built of the local tuffeau stone. The Château de Chenonceau is a French château spanning the River Cher, near the small village of Chenonceaux in the Indre-et-Loire department of the Loire Valley in France. It is one of the best-known châteaux of the Loire valley. The estate of Chenonceau is first mentioned in writing in the 11th century. The current château was built in 1514–1522 on the foundations of an old mill and was later extended to span the river. The bridge over the river was built from 1556 to 1559 to designs by the French Renaissance architect Philibert de l'Orme, and the gallery on the bridge, built from 1570–1576 to designs by Jean Bullant. Built by Jules Hardouin-Mansart, 1675–1683 for the duc de Chevreuse, Colbert's son-in-law, is a French Baroque château of manageable size. Protected behind fine wrought iron double gates, the main block and its outbuildings (corps de logis), linked by balustrades, are ranged symmetrically around a dry paved and gravelled cour d'honneur. Behind, the central axis is extended between the former parterres, now mown hay. The park with formally shaped water was laid out by André Le Notre. The Château de Montsoreau is the only Château of the Loire Valley to have been built directly in the Loire riverbed. It is also one of the very first example of a renaissance architecture in France. Montsoreau has been built in 1453 by Jean II de chambes (first councelor of Charles VII of France and ambassador of France to Venice and to Turkey) by order of the king soon after the end of the Hundred's years war. The french dramatist Alexandre Dumas made the château de Montsoreau world famous with its trilogy on the French Wars of Religion of which the lady of Monsoreau is the second volume. The Château de Vaux-le-Vicomte is a baroque French château located in Maincy, near Melun, 55 km southeast of Paris in the Seine-et-Marne département of France. It was built from 1658 to 1661 for Nicolas Fouquet, Marquis de Belle-Isle (Belle-Île-en-Mer), Viscount of Melun and Vaux, the superintendent of finances of Louis XIV. The Palace of Versailles, or in French Château de Versailles, is a royal château in Versailles in the Île-de-France region of France. When the château was built, Versailles was a country village; today, however, it is a wealthy suburb of Paris, some 20 kilometres (12 miles) southwest of the French capital. The court of Versailles was the centre of political power in France from 1682, when Louis XIV moved from Paris, until the royal family was forced to return to the capital in October 1789 after the beginning of the French Revolution. Versailles is therefore famous not only as a building, but as a symbol of the system of absolute monarchy of the Ancien Régime. ^ Applefield, David (6 April 2010). The Unofficial Guide to Paris. John Wiley & Sons. p. 112. ISBN 978-0-470-63725-8. ^ Giedion, Sigfried (1982). Space, Time and Architecture: The Growth of a New Tradition. Harvard University Press. p. 134. ISBN 978-0-674-83040-0. ^ Anderson, James Maxwell (1 January 2007). Daily Life During the French Revolution. Greenwood Publishing Group. p. 2. ISBN 978-0-313-33683-6. ^ Richardson, Glenn (1 January 2008). The Contending Kingdoms: France and England, 1420-1700. Ashgate Publishing, Ltd. p. 64. ISBN 978-0-7546-5789-7. ^ Jordi, Nathalie; Sommer, Lauren; Sussman, Anna (5 June 2007). MTV France. John Wiley & Sons. p. 146. ISBN 978-0-7645-8770-2. ^ Hempstead, Andrew; Cuthbert, Pamela; Aykroyd, Lucas (12 November 2013). Frommer's Far & Wide: A Weekly Guide to Canada's Best Travel Experiences. John Wiley & Sons. p. 149. ISBN 978-1-118-10169-8. ^ Auzias, Dominique; Labourdette, Jean-Paul (29 April 2014). Gironde 2014 Petit Futé (in French). Petit Futé. p. 353. ISBN 978-2-7469-7194-3. ^ Whittaker, Andrew (2008). France: Be Fluent in French Life and Culture. Thorogood Publishing. p. 25. ISBN 978-1-85418-493-1. ^ Ouvert au public (in French). Editions de la Caisse nationale des monuments historiques et des sites. 1983. p. 111. ^ Quest-Ritson, Charles (2007). Gardens of Europe: A Traveller's Guide. Antique Collectors Club. p. 114. ISBN 978-1-870673-55-6. ^ "La Dame de Monsoreau" (in French). dumaspere.com. 1998. ^ Hanser, David A. (2006). Architecture of France. Greenwood Publishing Group. p. 271. ISBN 978-0-313-31902-0. "Château" . Encyclopædia Britannica. 5 (11th ed.). 1911. This page was last edited on 18 March 2019, at 23:06 (UTC).